The Systems Department of Madras School Economics has the state-of-the-art computing facilities with latest hardware, software and supporting equipments. The Systems Department is managed and supported by fully self-contained Systems Department with professional systems staff having proven track record in handling any level of troubleshooting and carefully planned vision for future computing needs. The activities of System Department include in-house Software/Web development, Publishing, CD-ROM Authoring, Technical assistance in data conversion arising from time to time apart from routine system support and maintenance. 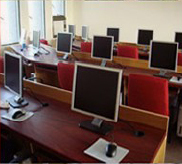 All computers are connected to robust, network-tuned Compaq / HP servers via campus-wide 100 Mbps Ethernet based local area network with strong network backbone and high-speed switches and routers. The institute has a complete Intranet, Internal mailing, Instant Internal Messaging and alerting system, which helps users in communicating with each other within the campus. The Computing center is fully equipped with latest peripherals like CD-Writers, Tape Drives for data backup. A high-resolution true color HP scanner caters to the requirements of users in data extraction from printed documents and in creating multimedia and graphic rich presentations. The institute has wide range of LCD, Slide and Over Head Projectors for any type of presentations. Several HP LaserJet printers are provided for the use of faculty, staff and students. The Systems Department also supports full-fledged state-of-the art Web & System Facility center with latest Intel Xeon processor based Compaq/HP Servers with CISCO routers and Hardware firewalls on a campus-wide Fiber Optic backbone. The web access is provided with leased line of 70Mbps Internet connection and the students in the hostel can also access the network facilities via WI-FI. The campus network has been extended to the hostel rooms. The institute will shortly launched the existing Library Information system via the web site in the form of Online Library for public access. The Computer Committee consisting of Director, Faculty, System Staff, Administrative Officer handles issues pertaining to computer facilities.